Jones plays meek, repressed sound engineer Gilderoy, who works on wildlife documentaries from his garden shed in Surrey. When he’s summoned to Italy to work on a movie entitled The Equestrian Vortex, Gilderoy assumes, not unfairly, that the film is about horses. It turns out that the film is in fact an Italian ‘Giallo’ horror movie, the genre made famous by the likes of Dario Argento throughout the late 1960s and 70s. Operatic, bloody and fetishistic in their level of detail, ‘Giallo’ movies are seminal in the history of the genre, but completely out of the ordinary to quiet, sensitive Gilderoy, who’s more concerned about being reimbursed for his plane ticket. Trying to categorise Berberian Sound Studio is akin to trying to put a square peg in a round hole. It’s a strange yet utterly engrossing experience that works on multiple levels. Most significantly, it’s a dazzling reminder of the importance of sound in cinema. We never see the movie on which Gilderoy is working (aside from the amusingly kitschy credits sequence); instead, the sight of him carving and tearing vegetables conjures up all sorts of lurid horrors, a potent reminder that sound can disturb more through the power of suggestion. It’s also a loving homage to a genre for which Strickland clearly feels affection. The minutiae of the little details creates a beautifully rich tapestry, whether it’s the girls in the sound booth forced to record screams over and over again, edits cutting closer and closer towards the mouth in the style of a Giallo death scene; to a black-gloved hand repeatedly seen flicking switches. One brilliant throwaway line refers to the sound effects for the unseen ‘aroused goblin’. The attention to detail is both heartfelt and ironic. The film can also be appreciated as a black (gloved) comedy of cultures clashing. On arrival in Italy, Gilderoy is immediately bullied and bossed around by the egocentric producer, Francesco (Cosimo Fusco) who cannot understand his inability to offer a handshake or his hang-ups about such pedantic details as plane tickets. Gilderoy has also brought with him several letters from his mother back in Dorking; the contrast between the twee content in her writings, centering on British garden birds, and the lurid horrors which Gilderoy is facing, is both funny and poignant, enforcing the sense that he’s a man out of his depth. Yet lurking beneath everything is an eerie commentary on authorship in cinema. When we reach the final third of the movie, rules are suddenly reversed, logic is upended and Gilderoy starts to believe that he is a part of the movie he’s working on. Is he being initiated into a coven of devils, the producer and director among them? Whatever is happening, Strickland pulls a wonderful kind of reversal when it’s revealed that Gilderoy is in fact a surrogate for us the audience. For just as Gilderoy realises that he holds little sway over The Equestrian Vortex, that he is subject to the whims (powers?) of the filmmakers, so we realise that Strickland is exercising the same level of control over us. As director, he is able to change the rules of the sound design as he sees fit, and we realise that we’re as much pawns as Gilderoy himself. What kind of statement is Strickland therefore making? That filmmaking is itself a dark art? That sound effects cause us to make associations but the existence of said effects owe themselves to a higher power? It’s a dazzling, metafictional comment on the viewing experience, sharing much in common with Cabin in the Woods from earlier in the year. But whilst it might be unsettling and frustrating, the film is never cynical. Strickland’s love of cinema is apparent from the first frame to the last, from the visual references to Giallo horror to the staggering attention to detail present in every frame (the amount of research that must have gone into finding appropriate recorders and sound equipment is surely exhaustive). Anchoring it all is an impeccable performance by Jones, whose ability to convey rumpled, decent humanity prevents the movie from becoming a cold, technical exercise in audience manipulation. 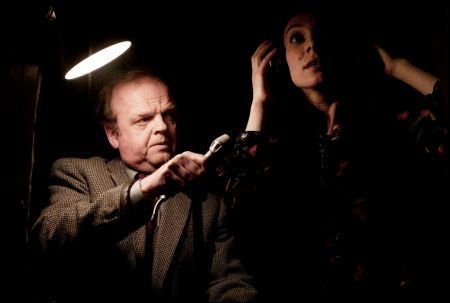 So what is Berberian Sound Studio? It’s not strictly a horror movie, despite riffing on the likes of David Lynch and Videodrome; really it’s more a commentary on horror. But the fact it can’t be easily boxed in is a very exciting thing, especially when considering so many movies nowadays are scrutinised by marketing executives and test audiences, which frequently conspire to rob films of their identity. In the end it’s a mystery, a puzzle and an idiosyncratic triumph which earmarks Strickland as a director to watch out for.